We can summarize the types of possible foods for fish in ponds according to the following categories of food types. 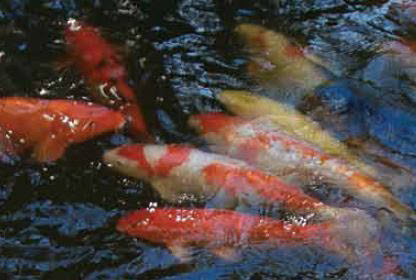 When caring for a pond full of prized koi or a water garden with a few goldfish we want to offer a good quality fish food to our aquatic friends as they can live a long life and can become bossom buddies over time! Don't overfeed your fish and always make sure you are giving fresh pellets or flakes, after all, who wants to eat stale biscuits!! Flakes or sequins: floating on the surface of the water, there is no advance preparation; distribute simply, sometimes émiettant to decrease the diameter of the flakes. Everything must be consumed until the flakes sink because the flakes are very polluting. Crisps or sticks: close to the snowflakes, they are made at low temperatures and are of better quality than the flakes. They degrade slower and lead pollution less than that of the flakes (mainly in the case of surplus). Their composition also reduces the algae problems. Pellets: they flow and therefore addressing species of open-water or background. Good quality (flakes), they are recommended for demanding species. Prepare the granules into a cup of water from the tray before distribution because the granules swell when wet: If granule swelling in the throat (the worst) or in the intestines of a fish, it can prove to be problematic, and for example lead to problems of digestion. Cakes, "wafers": in the form of compact discs, these foods are intended for groundfish or shrimp. Let them fall to the bottom of the aquarium without further preparation. Tablets, lozenges : thick disks, certain tablets can stick between rocks at the bottom reducing their consumption by the inhabitants of the bottom. Time for supper little guppies!! Webbox Rainbow Pellets Floating KOI CARP & All Pond Fish Food Bag Size - 20kg (2 x 10kg Bags) Buy ..
A proven high quality food for rapid growth and excellent skin quality. Highin unprocessed natural p..
Koi Sticks from Extra Select. A complete food for all types of pond fish. Contains cereals, vegetabl..
Increasingly popular, automatic fish feeders are no longer used solely for holidays and are recommen.. Complete and balanced diet for daily feeding.Manufactured from premium quality ingredients, providin..
A high protein, colour enhancing diet for koi and other pond fish.High quality protein (37%) for gro..
Nishikoi Wheatgerm is perfect for spring and autumn health and colour for all koi and pond fish. Nis..
Medikoi Probiotic from NT Labs is a multi-season food, scientifically formulated to significantly im.. Balanced diet formulaDesigned for prolonged floatingWith added stabilised vitamin CSuitable for all ..
A complete floating food for Koi and all cold water ornamental pond fish. Specifically formulated fo..
Tetra Goldfish Flakes Tetra Goldfish food are flakes with Bio-Active formula for goldfish and other .. Ideal goldfish food for cold water fish. These tasty flakes are ideal to boost the overall health an.. Complete food for all pond fish Feed Tetra Pond Sticks 2-4 times a day (depending on the temperature.. Mix of food sticks for a complete and varied diet. Fish enjoy a little variety in their diet, just a.. Specially developed floating food sticks for a healthy, balanced diet for pond fish when the water t..
Tetrapond Complete Koi Fish Food Sticks - 1.5kghigh quality complete foodspecially designed for the ..
More and more people consider pond fish to be social pets and want more interaction with them than j..
Webbox Rainbow Pellets Floating Fish Food are suitable for koi and pond fish. They're highly palata..